Let Peak Consulting ensure that you manage your time between social media and your business correctly and avoid choking your business. Social Media is about the people and not about your small business! Provide for the people and the people will provide for you. When Social Media first arrived on the scene, it was shot in the arm for Small Business. Small Business suddenly had easy and affordable access to markets previously the preserve of big business with big sales and marketing budgets. All Small Businesses and Young Entrepreneurs embraced every form of social media on offer in the race to get ahead. All that has now changed. Social Media is de-rigour and the various social networking platforms have had to move with the times or be left behind. This had led to Facebook, Twitter, LinkedIn, and YouTube arguably becoming today's market leaders. In turn, Small Businesses for their part have had to jettison numerous social networks in favour of just a few. But still this is not a tenable situation. Each social network has a raft of tools and applications that 'will enhance' your network and from a business perspective that means increasing your market reach and in turn, sales. All these social network tools and applications require effort to simply maintain let alone using them to their fullest potential, effort that primarily will be done by you and effort that takes you away from your core business objectives. 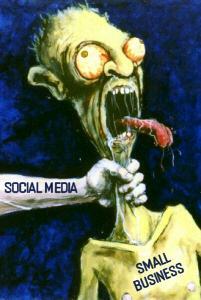 Left unchecked, Social Media could choke your Small Business! So where does that leave a business without the resources to support an independent Social Media department? Jettison the Baggage. Be economical in your reading of tweets and facebook posts. Stop following blogs except for industry relevant sources - spend less time reading and more time responding and engaging in online conversations. This means dumping the deadwood, getting rid of the networking platforms you are not engaging in. If you are a worthy contributor to social media, you'll find it'll spread your word (go viral) for you - and far better/faster than you or I could every hope to do by individually maintaining numerous social accounts across various platforms. Chose your Friends. Don't follow or accept friend invitations indiscriminately. Quality always beats Quantity, even in Social Networks. Yes, every 'friend' could become a potential buyer.. but there is a time cost. More arbitrary friends mean more useless tweets, more off topic facebook posting's, more spam emails and exponentially more 'friends' which means... - you get the picture. Be selective in your associations, it lends creditability to your online profile and increases the ROI in social media. Limit your Time. Proportion your time between production and marketing as per your business model - and stick to it. It is a false economy to believe otherwise and brings into question the very premise of your business model. No ones saying every minute spent on marketing is not valuable - it is, but only if you leave enough time to devote to actually creating the product that you are trying to sell. As a Small Business you have to focus on those areas that bring in the income and pay 'lip service' to areas that don't. In time you can redress the balance. Target your Audience. Blanket bombing is resource intensive and not very effective. Be selective in what platforms you use with what content and when and to whom you send it. So if you want to reach out to your professional peer group over the coming weeks then LinkedIn is perhaps the better option, or if its a 'sound bite' with a life expectancy of no more than 60 minutes you can't go wrong with Twitter. Perhaps you want to increase your online authority and 'bank' a demo or informative resource for others to draw on at any time, then YouTube is the place. Social Media is a great resource, but it can also be a huge drain on your already limited time when not managed correctly. A business starved of time will eventually succumb to choking and an early demise. Following these 4 points will go a long way to saving yourself from wasting time and allowing you to gain the most social media has to offer you and your company.